I open this topic because probable I'll make some new Qubide. - It doesn't have expansion bus. - It has extra 512K RAM if you want it. 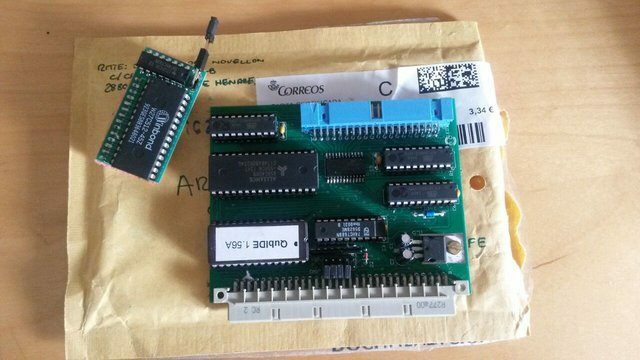 You don't need this kit to run Qubide in a sinclair QL but some program may require the TK extensions to work. This kit was around 8 €. If there are people interested in this kit, maybe I can make it. I will open a period of one month. If people are interested, please send me a private message telling me what you like (Qubide, Qubide + kit, kit) so I'll make an idea of ​​the proyect. I'm not Authorized to send Private messages so I write here that I'm interested in a Qubide + kit. You can contact me al lucaseverini at gmail dot com. What status of the Qubide with the additional daughter boards? I would interested in one of those. lucaseve wrote: I'm not Authorized to send Private messages so I write here that I'm interested in a Qubide + kit. I have such a Quibide board but what is the daughter board? Ralf R. wrote: I have such a Quibide board but what is the daughter board? I don't think anyone has done that, Derek. Jose Leandro has picked up the abandoned project from that website and modified it. Sorry, I thought the project was connected.